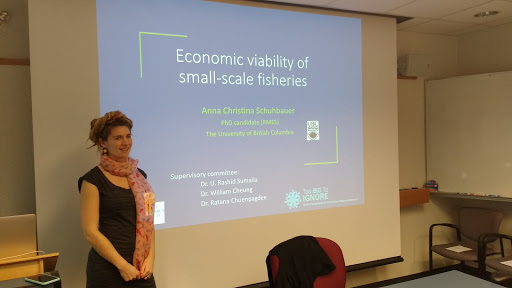 Anna Schuhbauer, TBTI PhD student, successfully defended her thesis on 'Economic viability of small-scale fisheries'. Anna studies at the University of British Columbia, Canada under the supervision of Dr. Rashid Sumaila. Her study was done as part of the TBTI Working Group 2 'Strengthening the Base' and the 'Economic viability' research cluster. The term economic viability, in general, refers to performance measures of an economic system such as financial performance, cash flow or simply profit. Anna’s work on this issue started with finding a clear description of economic viability for small-scale fisheries, which led to her defining economic viability as the net benefit to society from small-scale fisheries over time. Anna was leading the development of an indicator-based framework for assessing economic viability of small-scale fisheries on a global scale. She has also focused on the socio-economic aspects of small-scale fisheries and how they, along with the economic aspects, shape the economic viability of these fisheries. To hear Anna's defense, click on the image below.